A Foodie's Guide to the Capitol Corridor - Get on Board! Northern California is renowned for its diverse and inventive gastronomy, and connecting the region’s major culinary centers is the 170-mile Capitol Corridor train route. From farm-to-table trend-setters and high-end dining establishments, to local food truck favorites, you’ll find plenty of reasons to pick up a fork along the way. The world-class food-and-drink scene of the region – which spans both big cities and smaller towns – incorporates impressive diversity while showcasing the bounty of California with local, organic, and sustainably-produced fare leading the way. Whether you’re in the mood for tasty vegan cuisine or an exquisite cut of meat, here’s where to satisfy your appetite along the Capitol Corridor. Sacramento isn’t just the state capital—it’s a legitimate foodie town whose reputation is growing. The city recently rebranded itself as “America’s Farm-to-Fork Capital,” a title that showcases the area’s rich agricultural heritage and burgeoning culinary scene. Living up to the title, the region hosts a number of farm-to-fork events, including a Taste of Summer in June, and the Farm-to-Fork Festival that takes place every September. One of the most sought-after events on the calendar is the Tower Bridge Dinner, a seated meal served under the trestles of the iconic I St. Bridge spanning the Sacramento River. Featuring the cuisine of local chefs, it is a gala event to cap off and raise funds for the Farm-to-Fork Festival. For year-round foodie enjoyment, Sacramento is home to a diverse array of excellent restaurants. Head to local favorite Cafeteria 15L for American comfort food with a classic flair, including fish and chips and peach and tomato bruschetta. Designed by the same designers as the W Hotel, the restaurant has two plush outdoor patios and comfortable lounge space. For upscale ambiance, make a reservation at The Waterboy in Sacramento’s trendy Midtown. Its cuisine draws from northern Italy and southern France, including mouth-watering leg of lamb, daily fish, and herb ravioli. From the Sacramento Station, both restaurants can be reached by Sacramento Regional Transit (SacRT) with a free transit transfer from the Capitol Corridor, or by catching a cab, Uber, or Lyft. If you prefer to stay within walking distance of the station, nearby Old Sacramento has a number of tasty options as well. For dinner or drinks by the river, head to the rustic yet stylish Rio City Café. Sitting outside on the large patio, you can take in some of the historic sites of Old Sacramento, enjoy a glass of California wine, or dine on some tasty cuisine such as jambalaya, grilled salmon, or filet mignon. Award-winning food and delicious craft beers are the name of the game at Ten 22. And if you are looking for something a bit fancier, try having dinner at the historic Firehouse Restaurant, which is particularly nice for special events. Also along the Capitol Corridor route, bike-friendly Davis is located just 15 miles west of Sacramento. 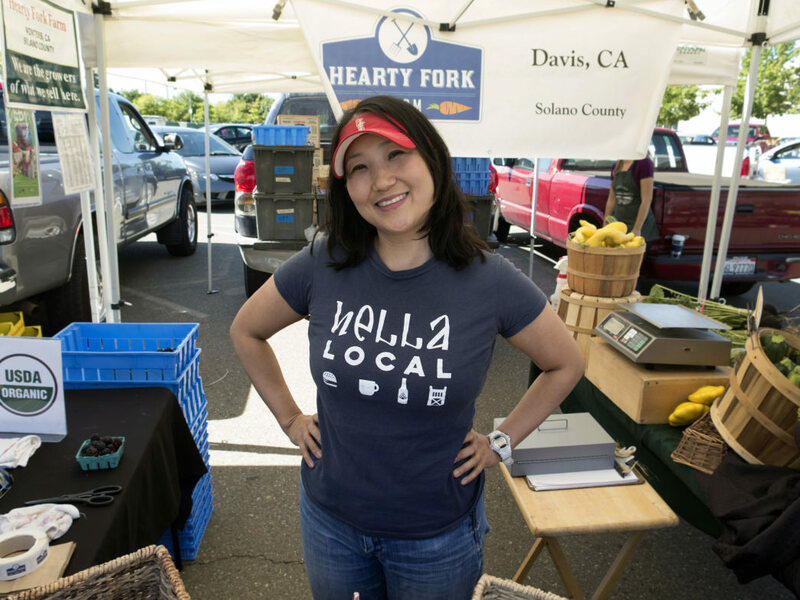 It is home to the University of California, Davis, as well as a vibrant and growing food scene. Its bustling farmers’ market is one of the best in the area. Each Saturday, rain or shine from 8am to 1pm, it showcases a variety of produce, meat, seafood, local eggs, honey, flowers, and more. For a truly local experience, pedal there on your bike, filling up your basket and backpack with provisions. Bikes are welcome aboard all Capitol Corridor trains! If you would prefer to grab a drink or bite out, try the University of Beer. With 60 beers on tap, you are guaranteed to find something you like. Or, head over to the Mustard Seed. This “cabin in the trees” is elegant yet down-to-earth, and their exclusively California wine list is sure to please. The East Bay town of Martinez may seem quiet and understated, but it’s home to a number of excellent restaurants and food options, and everything is in walking distance of Capitol Corridor’s Martinez Station. Fuel up for the day at Copper Skillet Courtyard, which has been serving rib-sticking dishes since 1973. Breakfast is on the menu all day, with more than 40 omelets from which to choose, plus options including eggs Florentine and a pancake sandwich. For a casual cup of joe, head to Barrelista Coffee House & Cafe, which features craft coffee drinks topped with foam creations. Lemongrass Bistro is the spot for Southeast Asian specialties reflecting the flavors of Laos, Vietnam, Thailand, and Malaysia. Menu highlights include curries, papaya salad, lemongrass stir fry, grilled pork with sweet chili sauce, and basil catfish. Roxx on Main features small plates for sharing and tapas-style eats, such as Italian sliders, cheese plates, and a variety of flatbreads. Stop by the Sunday farmers’ market to sample the freshest in local produce. During the summer, head down to Main St. to enjoy the summer Fridays on Main. With classic cars, live music, and a bounty of local restaurants opening their doors, it’s the perfect way to enjoy a summer weekend. Stop by one of the area’s many farmer’s markets to sample fresh produce and artisan treats. Photo by Franco Folini. Home of the country’s top-rated public university and birthplace of the 1960’s Free Speech Movement, Berkeley is on the bucket list of most foodies. This is largely because of Chez Panisse, chef Alice Waters’ revered establishment that pioneered the farm-to-table movement. The beloved restaurant, located in what’s called the Gourmet Ghetto, is back in business after a devastating fire in 2013, and is as popular as ever. While Chez Panisse may be the most famous restaurant in the Gourmet Ghetto, there are many other eateries for food lovers to enjoy, including Cesar, a lively tapas restaurant and bar; Gregoire, offering fine French-inspired gourmet take-out items; and Cha-Ya serving up specialty vegan sushi. Of course no foodie can overlook the venerable Cheeseboard with its unforgettable pizza, baked goods, and cheese. A convenient way to get a taste for all that this culinary neighborhood has to offer is to take part in the annual Taste of North Berkeley Restaurant Walk, featuring samples at over two dozen shops along Shattuck Ave. and Vine St., with proceeds benefiting local charities. There is also a Culinary Tour of the Gourmet Ghetto offered on Thursdays from 11am to 2:15pm – check the Gourmet Ghetto website for pricing and details. To get to the Gourmet Ghetto, take the Capitol Corridor to the Berkeley Station. With a free Transit Transfer from the train, you can take AC Transit’s Line 51B to the corner of University and Shattuck avenues and walk about half a mile up Shattuck. Alternatively, you can take a cab, Uber, or Lyft from the train station. If you don’t want to wander too far from Capitol Corridor’s Berkeley Station, your best bet is to explore Berkeley’s 4th Street shopping district, which also has some outstanding restaurants and foodie spots. Zut! Tavern specializes in regional California/Mediterranean dishes prepared with locally-sourced ingredients and served in their airy dining room or outdoor heated patio. In the mood for something more exotic? Try Iyasare, which marries rustic Japanese cooking with a modern California flair. A menu favorite is the starter, Ocean Umami. For classic, American fare with a laid-back ambience, Bette’s Oceanview Diner is the place to go. Another neighborhood favorite is Tacubaya, a casual Mexican eatery. Just a block from the Downtown Berkeley BART Station, which can be reached from Capitol Corridor’s Berkeley Station via AC Transit’s Line 51B, is Gather. It offers innovative craft cocktails and a regional wine list in addition to a wide-ranging menu of dishes made from local ingredients. Also near Berkeley BART between Durant Ave. and Bancroft Way is the cozy, brick-walled Venus, which offers global flavors and local favorites, including Marin Sun Farms lamb tangine; bibimbap, a flavorful Korean rice-based dish; and fish and chips. In August 2016, Venus transitioned to a European, no-tip model of service. Tigerlily serves organic Indian-inspired fare, with much of the produce coming from its own farm. This East Bay hub has long moved out of the culinary shadow of San Francisco, becoming a major foodie destination itself. One area in particular that’s giving San Francisco a culinary run for its money is the red-hot Uptown. This neighborhood is easily reached from Capitol Corridor’s Jack London Square Station by AC Transit with a free Transit Transfer, or the free Broadway Shuttle. For an eclectic take on Mexican, try Calavera Mexican Kitchen on Broadway. Vibrant and stylish, Calavera offers delicious small plates for sharing and boasts an extensive tequila and mescal collection, along with creative cocktails and an impressive wine list. Opened in June 2016, Agave offers Oaxacan-style food with farm-to-table ingredients and quality cocktails. Hopscotch is an upscale diner with a Japanese twist, while Uptown staple, Pican, offers innovative southern cuisine and an extensive whiskey menu. Don’t have time to venture beyond Jack London Square? Many outstanding restaurants are within just steps of the train station, situated nicely for strolls along the Oakland estuary. For an upscale evening with California cuisine that changes every night, try the prix-fixe menu at Haven, or head to Bocanova, which features cuisine from the Americas, including red pozole, Ecuadorian tripe soup, and seafood-centric dishes. For a more casual dining experience that showcases Oakland’s many global influences, taste the Caribbean flavors at Miss Ollie’s, where you can enjoy everything from split pea fritters, to salt fish and ackee, and skillet-fried chicken. Miss Ollie’s is about a 20-minute walk from the Jack London Square Station, or can be reached by taking AC Transit or the Broadway Shuttle. The farmers’ market is a year-round staple in Oakland, and there are plenty to choose from, starting with one right by the Capitol Corridor station in Jack London Square. Operated on Sundays by the Center for Urban Education About Sustainable Agriculture (CUESA), it includes cooking demonstrations and culinary education classes. The Old Oakland Farmers’ Market held on Fridays at 9th St. and Broadway is about a mile away from Jack London Square, and with its proximity to Chinatown, features many healthy and delicious Asian vegetables like long beans and lotus roots. 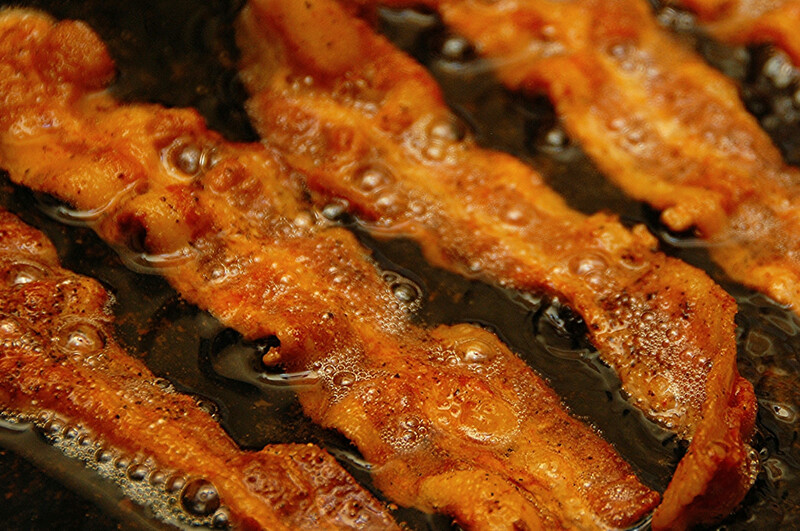 San Jose hosts a bacon-lovers dream come true: The Bacon Festival of America. Photo by Chris Yarzab. At the southern terminus of the Capitol Corridor route, this South Bay city, known mainly as the world’s technology hub, has a burgeoning dining scene. Seasonal dishes made with local ingredients are on the menu at The Table, which is about two miles from the San Jose Diridon Station and accessible via the Valley Transportation Authority (VTA) light rail with a free Transit Transfer from the Capitol Corridor. It features braised beef cheeks, sunchoke soup, and pan-roasted sockeye salmon, along with craft cocktails and a progressive wine selection. Mexican fusion fare, meanwhile, is the specialty at Zona Rosa, with creative takes on enchiladas, shrimp tempura, skirt steak, and more. It’s about a 20-minute walk from the train station or can be reached via a VTA bus or by taking a cab, Uber, or Lyft. 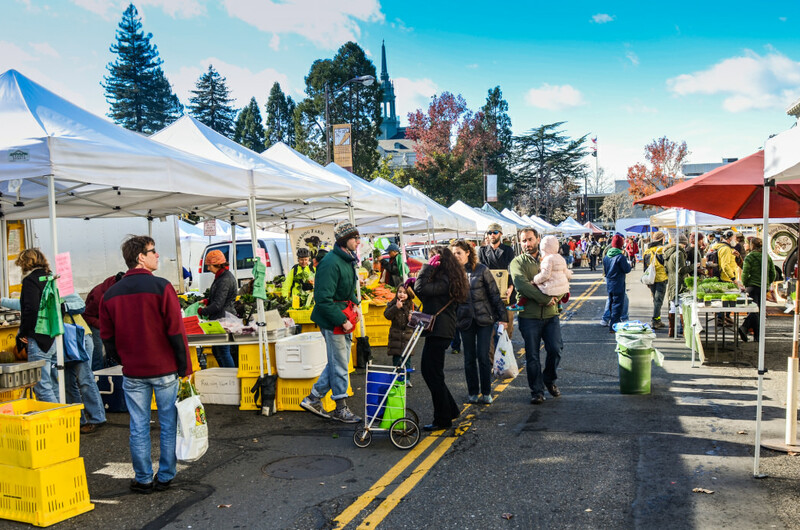 San Jose also has its share of farmers’ markets. Closest to the Capitol Corridor’s San Jose Diridon Station is the San Jose Downtown Association Farmers’ Market at San Pedro Square. It’s open on Fridays from 10am to 2pm, May through November, and features fresh produce from more than 30 regional growers. You can get there on the VTA or walk about 20 minutes from the San Jose Diridon Station. Featured image provided by M Anima.